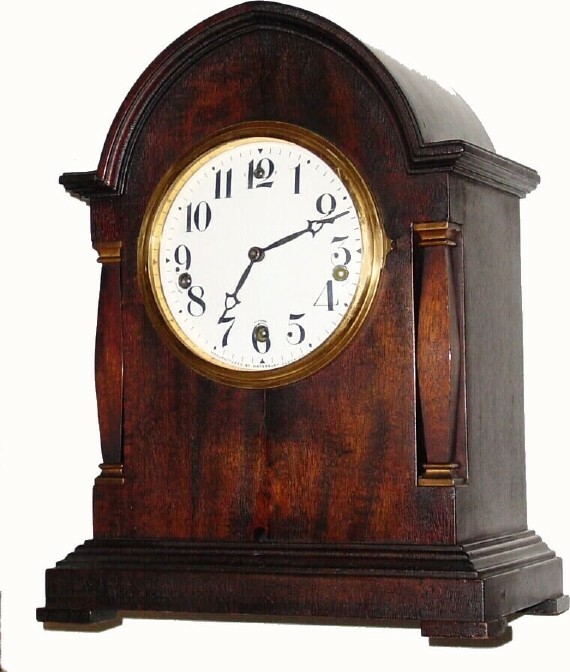 C.1917, Waterbury Clock Co., "Chime Clock 501" 8-day time/chime/strike mahogany mantel clock, in excellent original condition. The clock chimes the quarters on 4 steel rods (with brilliant tone). There are a couple of very small dings on the top, and a small dry crack on the front below the dial (has been there a long while and is not objectionable). The signed porcelain dial is perfect and retains a nice cast brass bezel. There is a label on the bottom of the case. The movement is signed Waterbury and with patent dates. Height 163/4"